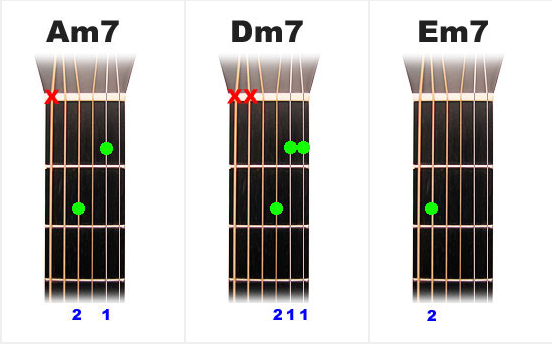 By far the most commonly used chord flavors are those you have now learned: major, minor, major7th, 7th and minor 7th. You will find that just about every modern tune ever written, except perhaps for jazz and fusion, consists mainly of these flavors. Traditional folk and country music rarely stray from pure major and minor chords with the odd 7th thrown in; pop music allows for a bit more complexity and you will hear major7th in that genre. There are, of course, many other flavors that can be used, but these are the main ones to learn first. It's also good to keep in mind that the 7th versions of both major and minor are basically the same as the triad versions. In other words, if in doubt, you can always just play a plain major or minor if you forget the 7th versions. The Chord Police will not come and arrest you, in fact they probably won't hear the difference. That added 7th note is more of a detail, not an essential note, in the bigger picture of the tune. That's not to say that you should ignore the little 7th symbols, of course, but remember that at the core of every 7th chord is a simple triad. Just as major chords can have notes added to the three triad notes, we can do the same to the three open minors. Minors consist of a root (1), minor third (b3) and fifth (5) and, just like the majors, the next note we can add is the 7th note of their scale, which is the flat 7, also known as the 'minor seventh'. These three chords are the same: 1-b3-5-b7. Just like major chords, the minors have two different kinds of sevenths. By far the most common is the plain old 7th (shown below), which uses the flat 7. It's the one that arises naturally from the minor scale, but there is also the odd sounding 'minor major7th', which uses the major 7 note. They are rare and we won't go into them here and now. I'll say it yet again: the important thing to understand is that these three chords have the same quality—minor seventh—even though they look different. If you take the time, you'll see that a root has been sacrificed for a flat 7, which is two frets lower in pitch than the root. In the case of the A and E chords, the 7th are open strings, in the case of the D, the 7th is the C note on the second string. So these chords all consist of the same ingredients, namely the root (1), flat 3rd (b3), fifth (5) and flat 7 (b7), and therefore sound the same. You now have a bunch of open chords to practice. Always try to compare them to their plain old major counterparts. You will learn a whole lot about music theory just by doing that, by 'seeing the numbers'. The major scale and chord are the standard by which all other scales and chords are measured, so the sooner you start to relate everything back to them, the better. There's no need to worry about any of that if you're just starting out but as you progress as a musician, you will begin to realize the importance of knowing what it is you're playing, and the surest and quickest way to do that is to always relate everything back to the major scale/chord. Now comes the harder part: what if the song you're learning requires you play a chord that's not one of the open chords? Well, you're going to have to play a barre chord ...but before we look at barre chords, let's have a look at some trickier progressions using chords we have learned so far.